Burning a combination of rocket-grade kerosene and liquid oxygen, six YF-100 engines on the Long March 7’s core stage and boosters lit with a flash of orange light and climbed away from a new launch pad at 1200 GMT (8 a.m. EDT; 8 p.m. Beijing time) Saturday, according to the China Aerospace Science and Technology Corp., or CASC, the Chinese space program’s state-owned prime contractor. Thousands of space enthusiasts crowded around the Wenchang launch base on Hainan Island off China’s southern coastline to get a view of the nighttime blastoff. In a rare move for China’s still-secretive space program, authorities established eight viewing sites around Wenchang to host the public. Climbing atop more than 1.6 million pounds of thrust, the 174-foot-tall (53-meter) rocket soared southeast from Wenchang, releasing its four liquid-fueled strap-on boosters at about T+plus 2 minutes, 55 seconds, to fall into the South China Sea. Moments later, the twin-engine first stage shut down and separated. Four smaller YF-115 engines, burning the same kerosene/liquid oxygen mixture, ignited on the Long March 7’s second stage to continue the journey into space, reaching a preliminary orbit about 10 minutes after liftoff. The Long March 7 is the most powerful rocket ever built in China, with capacity to place nearly 30,000 pounds — about 13.5 metric tons — into low Earth orbit, roughly equivalent to the performance of a United Launch Alliance Atlas 5 rocket with two solid rocket boosters. That figure will soon be bested by the heavy-lift Long March 5 launcher, will haul up to 55,000 pounds — 25 metric tons — into low Earth orbit after it debuts later this year from a nearby launch pad at Wenchang, matching the low-altitude orbit capability of ULA’s Delta 4-Heavy rocket. 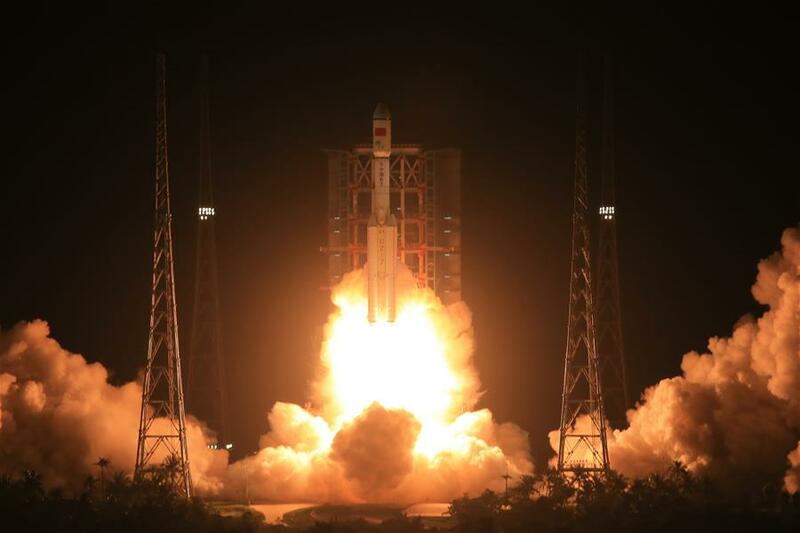 China’s official Xinhua news agency reported the Long March 7 reached an orbit with a low point of about 120 miles, or 200 kilometers, and a high point of about 244 miles, or 394 kilometers. 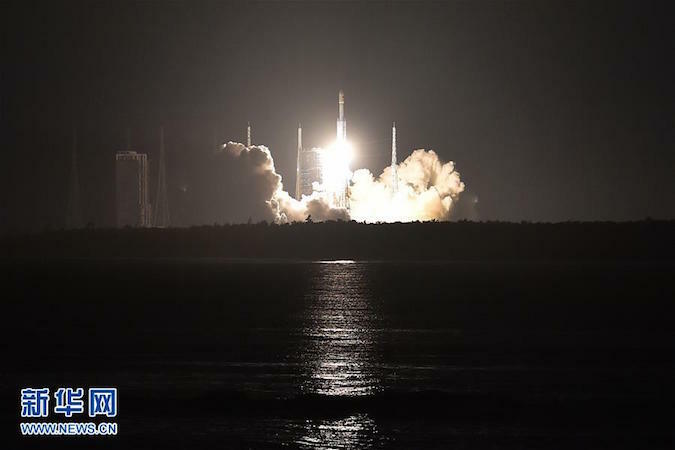 Independent tracking data fro the U.S. military showed two objects attributed to the Long March 7 launch orbiting Earth at a similar altitude, with an inclination of 40.8 degrees. Several experiments and satellite were bolted inside the rocket’s aerodynamic nose cone. 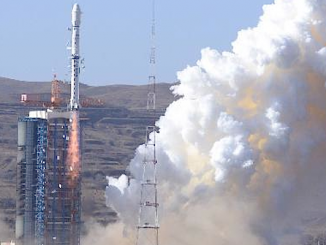 In a statement released after Saturday’s launch, CASC said the payloads included a Yuanzheng 1A upper stage that was programmed to ignite several times after separation from the Long March 7’s second stage. The Yuanzheng upper stage is similar to space tugs flown on other Long March rocket variants to place satellites for China’s Beidou navigation network into high-altitude orbits. A sub-scale capsule for a next-generation crew spaceship also flew on Saturday’s launch for an atmospheric re-entry test, kicking off development of a spacecraft to replace China’s Shenzhou crew transport, CASC said in a statement. 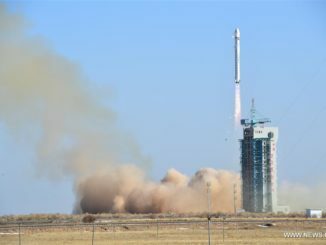 The People’s Daily, a Communist Party newspaper, reported the other small satellites launched Saturday will demonstrate techniques to clean up space junk, test communications technologies, and measure Earth’s gravity field and radiation environment for Chinese university students. There was also an experiment aboard Saturday’s flight to investigate satellite refueling in orbit, the People’s Daily reported. The Long March 7 will eventually become a workhorse for China’s space program, receiving certification to carry astronauts and send automated supply ships to China’s planned space station. Flights of the Tianzhou cargo craft, analogous to Russia’s Progress resupply freighter, will begin next year to service China’s Tiangong 2 space lab, a human-rated testbed for a larger orbiting complex set for completion by 2022. The China Academy of Launch Vehicle Technology, or CALT, a division of CASC responsible for rocket development, said Saturday the Long March 7 will assume most of the country’s space launch needs. In development for eight years, the Long March 7 is one of several new rockets Chinese officials plan to replace the country’s existing launcher fleet. 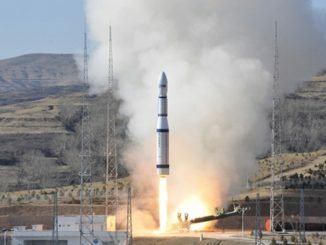 The Long March 2, 3 and 4 series of rockets are based on technology originally developed in the 1970s and 1980s. They also burn a toxic mix of hydrazine and nitrogen tetroxide propellants, chemicals that are harmful to humans and the environment. The Long March 6 is the smallest of the new rocket fleet, capable of catapulting small satellites into low-altitude orbits. It successfully flew for the first time in September 2015. The Long March 7 will serve mid-sized payloads, and the Long March 5 is for heavier missions. Chinese space officials and state media outlets touted the switch to more environmentally-friendly kerosene and liquid oxygen propellants, which are already widely used on rockets in Russia and the United States. The new kerosene-burning engine for the Long March 7 also generates more thrust and is more fuel-efficient, CALT said in a statement. Launches from the Wenchang space center, built between 2009 and 2014, also fly over open ocean instead of over land, allowing the rockets to deposit spent rocket stages in the South China Sea. Wenchang sits at 19 degrees north latitude, closer to the equator than any other site in China, allowing rockets to take better advantage of Earth’s spin rate and put heavier satellites into space, especially communications payloads heading to geostationary orbit. Wenchang’s coastal location also permits deliveries of large spacecraft by sea. China’s other launch bases are in land-locked regions, limiting transport options to road and rail connections, Xinhua reported. The climate at Wenchang is wetter than other Chinese space centers, so engineers added waterproof skin to the launch complex and the new rocket family. Workers erected four lightning protection towers around the Long March 5 and Long March 7 launch pads to shield the rockets from damage during thunderstorms. The maiden flight of the Long March 7 will not only be followed by the debut of the Long March 5 later this year. Chinese engineers are finishing testing of the Tiangong 2 space lab, a follow-up to China’s Tiangong 1 module that hosted astronauts in 2012 and 2013. Tiangong 2 will launch as soon as September on an older-model Long March 2F rocket from a launch center in northwest China, followed by the end of the year with the liftoff of a two-person crew on the Shenzhou 11 mission to visit the orbiting lab for 30 days.